How well do you remember details of a photograph? A new book by an old-timer. Based on Nick's new book. Games are tools for debrief, dialogue, and discovery. Trust me, this is good stuff. Five books on the same topic. We use various visualization techniques and graphic cues to memorize verbal materials. But how do we remember details of visual materials? How do we memorize a photograph? Participants study and memorize a photograph. Later they exchange the photograph with a partner and quiz each other. Memorize details of a photograph. Recall these details to respond accurately to questions. Study a photograph. Shuffle the deck and give a card to each participant. Ask the participant to study the picture for 60 seconds paying attention to details and memorizing as much information as possible. Find a partner. Ask the participants to pair up with each other. Then ask the participants to exchange their photographs. Quiz each other. Instruct each participant to hold the card so she can see the photograph but the other person could not. Ask the members of each pair to take turns to make a true or false statement related to the card (example: There are parallel lines on the floor). The other person (who had studied the card earlier) responds True or False. The person holding the card awards one point for each correct answer. Tell the player not to ask trivial statements (example: There are more than 100 leaves in the bush) or statements that require inferences (example: This is a street in Laos) or subjective statements (example: The woman is worried about catching pneumonia). Remind the players that what goes around comes around. Continue the game. Players take turns to make a total of five statements about the photograph on the card they are holding. At the end of the fifth statement, they retrieve their card, thank their partner, and pair up with someone else. They game is played in the same fashion until the end of a pre-specified period of time. All taxis in the photo are yellow. 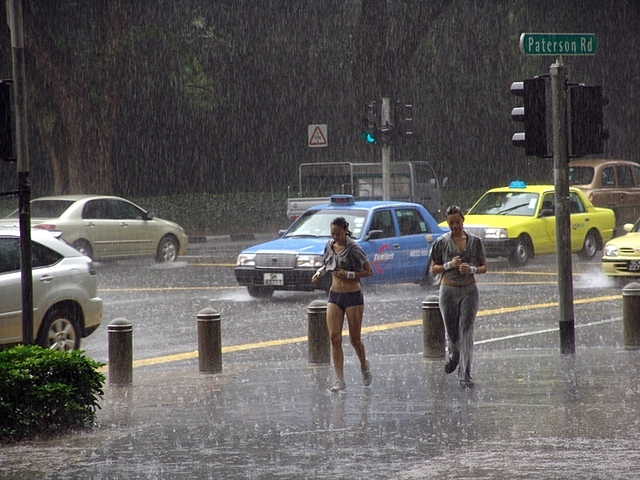 Two people are drenched in the rain. The road is named “Paterson Road”. You can see a traffic light that is red. What additional statements would you make? Nick Smith has been playing games for 20 years. You can learn more about him through the Guest Gamer interview in our December 2008 issue and conduct his rope game called Blind Square in the same issue. If you want to read more of Nick's stuff, we strongly recommend his new book, Making Games Work: More Effective Learning in Teams . You can order this book by visiting http://www.squarepegscoaching.com/making-games-work.html . This book is primarily a broad-brush reference work on games, aiming to be helpful and all-encompassing without getting bogged down in too much theory. It touches on the whole process of running a game, from the original learning outcome required to the evaluation of how well it worked. It is my hope that by reading this you will be prompted to consider all the various aspects necessary for good running of games. The book will make you think about new aspects to games and challenge you to improve the games you are going to play. Some of you will choose to read this book from cover to cover. Others of you will want to refer to individual chapters. Each chapter has been written in a reasonably standalone way. For example, if you have found that your briefing for games leaves a lot to be desired then go to that chapter and use my suggestions to improve. For those who struggle with games going off the rails then the chapter on activity and the actual running of games will allow you to ponder ways of intervening and improving the games mid-flow. Because I expect chapters might be read in isolation, there is a little bit of overlap in some of them. If you do read from here to the last page then please forgive any repetition that is there for the chapter-only readers. There are cross-chapter references though, which will lead you to more information related to where you have been reading, which will open new avenues for exploration and development. The wide scope of the book in terms of where games may be used might mean that your situation is slightly different to the places I was imagining as I wrote. In this case take the ideas, adapt and apply them to your own workplace. Ultimately this book is about making your games work better and for that you will need to go out and play more, experience and learn for yourself. Here are a few golden rules that you would do well to bear in mind if you want to make the most of the games you play and get the best advantage from them..
You can manage a remarkable amount, have more abilities than you imagine and can instill great learning using the power of games. If you don't believe me, run some more challenging experiences or take your team somewhere that will challenge and push your people. See how much they can do and realize about themselves for the first time. If it is true for them, why not also for you? When you observe everything that is going on, you will be able to use more of it for learning, whether that is obvious to everyone or a subtlety that most people miss. Knowing what was said and done (and being able to guess at what was felt based on your observations) will put you in a strong position when it comes to reviewing and sucking the deepest of learning from the experiences. It will happen regardless of the time spent planning and your accumulated years of experience. People are incredibly resourceful and will do whatever it takes and sometimes they will see opportunities where you have not. But because you are also resourceful, you will be able to take the unexpected and use it to your advantage somehow. Just like the participants, if you are having fun then you are in a better place to learn. On top of your own learning though, if you are happy and having fun then that will create a comparable climate for the participants. This will inspire them to also have fun, making them more open to the learning process. After the experience, participants should barely remember your input. You need to be like a great leader who helps people to accomplish things in such a way that they believe they managed this by themselves. If they remember you it suggests that you have been interfering too much or seemed to be part of the team. You are not part of the team and at times you will need to let them know this quite clearly as they look to you for advice or instructions. You are merely there to facilitate their process. Unless you want to keep them on edge as a parameter to be dealt with, or you are helping them to experience change, be as consistent as possible in the way you run a succession of games. That way, participants can settle into your style and simply concentrate on what they are doing, rather than being concerned about what you might do next. There may be occasions when games don't run as well as you expect. Nevertheless, however rubbish you think the game was or simple the lessons were, people can't not change. If you provide some form of experience and people go through it, they will be different afterwards. They will find out something about themselves, their team-mates, the environment or the task and this will have an effect on them. You might not notice what they get from it and it is unlikely you will see the change unless you work with the group over a longer period. Be confident though that your process and games generally will have an impact. Reading a book will not make you a games guru, able to achieve the most amazing learning from the simplest of games. You will eventually but it might be hit or miss to start with—sometimes there will be more learning and at other times not as much as you had hoped. With practice, the amount the participants gain will increase. This practice doesn't always need to be with an audience. When you play your games with anyone, you will learn something about how these games work, what to do, what to avoid etc. This will raise you to a new level. Games that flow smoothly because you have covered all the bases will allow people to get the most learning from the experience. If you are constantly having to deal with items that you didn't plan for, it will distract you. You need to be able to relax and watch what is happening in order to use it to your participants' advantage. A plan will also provide you with the freedom to improvise because you always have somewhere to come back to when you need to. Even though you are resourceful you will accomplish more with a plan. Your participants will accomplish a surprising amount so expect more from them. Push them to their limits in whatever way you can so that they surprise themselves and learn about what is possible. It is in this zone where they are being stretched that they are more likely to be themselves—any masks have to come down because they can't be sustained under that kind of pressure. You might think that you are being gratuitously nasty but it is ultimately for their benefit. This engaging card game requires players to recall and apply customer service concepts and principles they have learned from training sessions, books and articles, and personal experience. The object of the game is simple: to win one card of each of the four suits. Each clubs card specifies a customer service category (such as words customers don't want to hear). To win a clubs card, you come up with a rapid list of items that belong to the category. Each hearts card contains a pair of customer service concepts (such as first impressions and lasting impressions). To win a hearts card, you identify the most important similarity and difference between the concepts. Each spades card contains a mystery concept (such as repeat business). To win a spades card, you silently convey the mystery concept by drawing pictures. Each diamonds card contains a scenario (such as a customer trying to get a questionable refund). To win a diamonds card, you perform in a roleplay a skit around the scenario. A set of 52 cards with four types of customer service items. A How To Play manual with detailed instructions for different games and a list of recommended books. The game is for three to six players. It lasts for 15 minutes to an hour. You can play the game for a pre-specified period of time. This card game regularly sells for $49.95 (plus shipping). As a reader of TGL , you can purchase the game at a discounted price of $40 (plus shipping). When you order this game through our secure online store, enter the coupon code TGL-AUG to receive the discounted price. Cryptograms are highly engaging language puzzles. We wrote about the use of cryptograms embedded into simulation games in our February 2010 issue of TGL . You can use cryptograms in textra games and interactive lectures: You present the training content through a handout or a lecture and ask the participants to decode a summary statement that is presented as a cryptogram. Frv wzm vot wdfjgrhdzeo pm gtigdz hzeto zmu pmgtdzwgpct xtwgvdto: Frv jdtotmg gkt gdzpmpmh wrmgtmg gkdrvhk z kzmurvg rd z xtwgvdt zmu zon gkt jzdgpwpjzmgo gr utwrut z oveezdf ogzgtetmg gkzg po jdtotmgtu zo z wdfjgrhdze. Use the instructions and hints given below and solve the cryptogram. For online tools for creating and decoding cryptograms, read this issue's Check It Out. Glenn Hughes is Director of Global Learning for KLA-Tencor Corporation, a leading semiconductor equipment company and inductee to TRAINING Magazine 's “Top 10 Hall of Fame”. He is also founder of SMART as Hell, a firm that creates high performance tools for individuals and companies working in competitive environments. Before entering the learning and development industry, Glenn lived in Asia for 10 years, managing multi-million dollar service accounts for some of the biggest semiconductor firms in the world. I've been using games since I entered the learning field seven years ago. I started modifying and designing them about five years ago. Glenn: Photo Jolts . I lay out a collection of photos and ask the participants to choose one that serves as a metaphor for their topic of discussion. This can be used for customer service, diversity, or idea generation. Glenn: The Thiagi library, obviously. Gamestorming . Thinkertoys . The Art of Game Design (book and card deck). I'm working on a training package on improving interpersonal trust. I'm using twitter to help me share some preliminary ideas. Because it is likely to be a lengthy series of tweets, I'm publishing it in two parts. Here is the first part. I'm using SPARK as an acronym to refer to five factors associated with interpersonal trust. “S” stands for selflessness, and important factor for increasing interpersonal trust. Another important factor in interpersonal trust: Predictability. This is the “P” in the SPARK acronym. One more important factor in interpersonal trust: Authenticity. This is the “A” in the SPARK acronym. Another important factor in interpersonal trust: Relatedness. This is the “R” in the SPARK acronym. Last factor in the SPARK acronym: Knowledge. This is the “K” in the SPARK acronym. Each of these five factors is necessary but not sufficient. You need them all. You need to integrate selflessness, predictability, authenticity, relatedness, and knowledge to increase trustworthiness. In the SPARK acronym, “S” stands for selflessness. It is not about you. Selflessness. Synonyms: altruism, philanthropy, kindness, charity, and other-centeredness. If you are (and if you are perceived to be) selfless and altruistic, people trust you more. Increase your interpersonal trustworthiness by going out of your way to help others. Offer to help. Be a servant leader: Find out what others want and provide it. Volunteer for activities to help others in your team. To increase interpersonal trust, share credit with others involved in the project. Share your talents, techniques, and tools with others. Don't withhold. To increase interpersonal trust, treat your special friend preferentially to the others. To increase interpersonal trust, set aside time to spend with your friends. To increase interpersonal trust, demonstrate that you have the other person's interest at heart. To increase interpersonal trust, include your friends in your major missions and projects. In the SPARK acronym, “P” stands for predictability. You do what you say you will do. Predictability. Synonyms: reliability, constancy, fidelity, accountability, and conscientiousness. Be careful about what you promise others. Do not make rash promises that you cannot meet. Do not under-promise. Do not over-promise. Make realistic promises. If you cannot meet a deadline, let other people know immediately. Reduce your workload so you can meet your deadlines. Respond to other people's telephone and email messages immediately. Make your promises in specific terms. Be clear about your agreements. If you are predictably selfish, it will not increase your trustworthiness. You need selfless predictability. Fake predictability will not increase your trustworthiness. You need authentic predictability. Increase your trustworthiness by not saying "Yes" unless you mean it. Increase your trustworthiness by being sure to inform others if you change your plans. Increase your trustworthiness by keeping your commitments. Increase your trustworthiness by not offering something unless you can deliver it. Increase your trustworthiness by making your requests—and offers—specific and clear. Increase your trustworthiness by using direct and assertive language for your requests. Increase your trustworthiness by clearly saying “yes” or “no” to a request. Increase your trustworthiness by asking for clarification when someone makes a request. “A” is for Authenticity. Synonyms: genuineness, truthfulness, integrity, walking the talk, matching thought and action. Increase your trustworthiness by always speaking the truth even if hurts you—and the others. Increase your trustworthiness by increasing your self-awareness. Increase your trustworthiness by sharing your weaknesses and strengths with your friends. Increase your trustworthiness by acknowledging potential problems. Increase your trustworthiness by aligning your words with action. Increase your trustworthiness by disclosing all relevant information. Increase your trustworthiness by not flattering people insincerely. Increase your trustworthiness by not talking negatively about people behind their back. Increase your trustworthiness by not gossiping. Increase your trustworthiness by avoiding cynical comments. Increase your trustworthiness by not misquoting other people. Increase your trustworthiness by truthfully explaining the reasons behind your decisions. Increase your trustworthiness by maintaining high levels of integrity. Increase your trustworthiness by being transparent and sharing your business model. Increase your trustworthiness by sharing your decisions with everyone else. Increase your trustworthiness by admitting your mistakes as soon as you become aware of them. What additional ideas do you have for increasing your authenticity? Drop your mask. Don't roleplay. Forget the script. Improvise. If you feel uncomfortable for whatever reason, say so immediately. Express your true feelings and emotions. Follow me on Twitter @thiagi. Check the next issue of TGL for the second part of this series of tweets. Emotions play a big role in determining how we react to situations. Being able to influence emotions in positive ways can lead to a passionate, engaged workforce, effective, efficient communication, and increased retention in learning. Our olfactory sense is an underutilized avenue to reach emotions. Power Tip: Serve garlic bread to reduce team tension. Read more in the July 2012 issue of Firefly News Flash : http://www.thefirefly.org/Firefly/html/News%20Flash/2012/July%202012.htm . Earlier in this GameLetter , we explored the use of cryptograms as an instructional puzzle. You can type (or copy and paste) the text passage that you want to be converted into a cryptogram. Fill in your puzzle's title and content, and choose whether to replace the letters with numbers, different English letters, or Greek letters. Then click “Create My Puzzle!” to generate a puzzle that is ready to be printed and given to participants. If you want to cheat, you can let the computer solve the cryptogram puzzle presented earlier in this issue.